Jon R. Campbell is Executive Vice President of Wells Fargo. He leads corporate philanthropy and community relations, and serves as President of the Wells Fargo Foundation, for Wells Fargo & Company. He also served on United Way Worldwide’s USA Board from 2010-2017, chairing the U.S. nominating committee and serving as a member of the worldwide governance committee. Campbell took a few minutes recently to reflect on the future of corporate philanthropy, and Wells Fargo’s relationship with United Way, the world’s largest privately-funded nonprofit. Wells Fargo and its team members have been United Way’s No. 1 workplace giving campaign for 10 years. Together, we’re marking a decade of dedication to building stronger communities. What does philanthropy mean to Wells Fargo? Philanthropy is grounded in corporate citizenship, one of our six corporate goals. We want to be No. 1 in corporate citizenship and make a positive impact in every community in which we live and do business. One of the taproots of corporate citizenship is philanthropy: engaging individuals and contributing to communities in a way that drives measurable social impact. Our relationship with United Way is fundamental to this principle. We share common goals, a belief in the value of solving problems together, and a conviction that unleashing the spirit of individuals – whether as community volunteers or leaders, or as donors of our workplace giving campaign – makes all the difference. You’ve been involved with United Way for many years. Any favorite memories? There are so many! I’ve been volunteering with United Way for 42 years, so it’s been a significant part of my philanthropic life. I recall one time when I advocated for more people to get involved in making a difference in my community, despite some nay-sayers. This was when I’d moved back to Twin Cities (MN) in the early 2000’s and was chairing the fundraising campaign for the United Way of Greater Twin Cities. While there were many generous donors, United Way did not have an Alexis de Tocqueville Society – a highly-respected group of people who donate $10,000 or more to United Way’s community-building efforts. My wife and I held a party to introduce the idea to Twin City leaders, bringing passionate change agents together for thoughtful conversation about how to do more in our community. The enthusiasm for what we could do together overrode any concerns. Today, there are more than 700 members of the Twin Cities’ Tocqueville Society, and the community is stronger for it. Note: United Way’s Alexis de Tocqueville Society is a global vehicle for community transformation, with 25,000+ people generating more than $10 billion to date. How do you see philanthropy changing over the next 10 years? We’re heading for deeper, more fundamental change – with Corporate America tapping into its business expertise more often. For example, the housing affordability crisis remains an overwhelming concern for millions of people and families, and Wells Fargo has expertise in housing and financial education. We can do more than give grants to community agencies. We can make a difference through advocacy, capital, homebuyer education and deeper collaboration with a more focused group of partners. Another shift is equity becoming the focal point. Diversity and inclusion are already part of the philanthropic conversation, but we’re thinking about equity at a more fundamental level when it comes to affordable housing. How do we create a level playing field? How do we tackle underlying roadblocks that may not be immediately visible? From where I sit, putting equity front and center in philanthropy will be a big shift over the next decade. In many ways, these shifts align with what United Way is already doing. In the 42 years I’ve been involved with United Way, I’ve seen it shift from raising money for worthwhile community agencies to really driving change in the community. I think Corporate America and leading philanthropic partners like United Way are aligning more than ever before and taking action together to really make a difference. What’s the most surprising thing you’ve learned about United Way and our work across communities? Global reach and local impact co-exist side-by-side in United Way. In 900 communities across America, Wells Fargo team members work with local United Ways to solve the toughest problems facing those communities. Local chapters are funded and led locally, allowing community-based solutions to flourish across the broader focus areas of financial stability, education and health. But that network can come together quickly to undertake a national initiative. If a large enterprise like Wells Fargo wants to achieve something significant and substantive, it needs United Way by its side. A great example is the 2017 holiday food drive we partnered on. Wells Fargo wanted to launch a national initiative to address food insecurity, involving 6,000 local bank branches – something we’d never done before. Within weeks, United Way was able to rally thousands of people in those communities (combined with monetary donations) translated into 433,814 meals. *Note: In addition to the holiday campaign, Wells Fargo donated $5 million to support United Way’s hunger relief efforts across 26 markets. The grant will strengthen existing hunger-focused work, including breakfast in classroom programs, local food banks and urban gardens for students. In the last decade, Wells Fargo and its team members have contributed more than $713 million. This kind of support in communities helps United Way tackle pressing social problems. How does Wells Fargo keep team members inspired each year to support their communities and give back? Part of what makes Wells Fargo’s philanthropy unique is the passion and generosity of our team members who multiply our community impact, locally and collectively. With 265,000 team members working across the country, we are very intentional about giving them support and encouragement to get more deeply involved in the causes they care about. A big part of that is volunteerism. Our team members invested more than 2 million hours of “sweat equity” last year. Many of the problems we face today need that kind of investment for solutions to take hold – it’s not just about donating money. 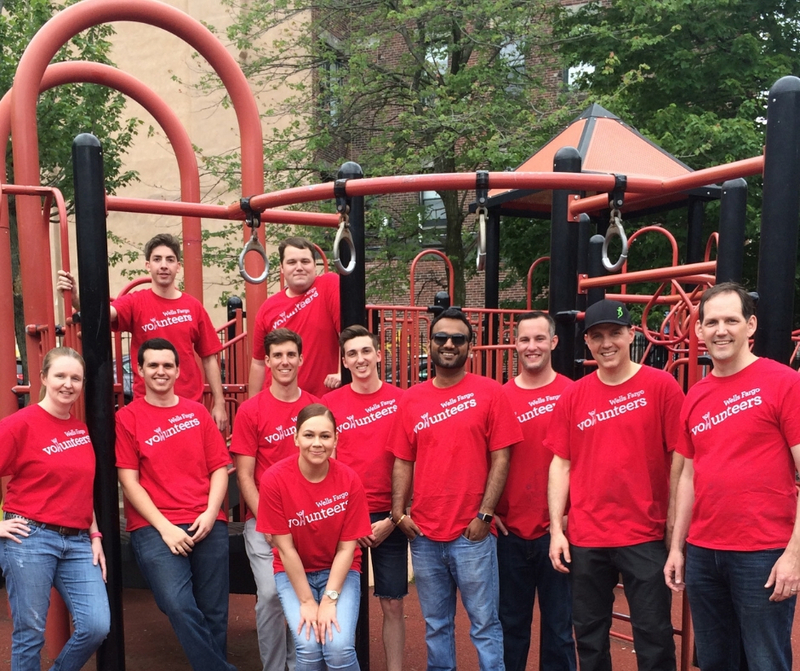 In fact, we give team members up to 16 hours of paid time off to volunteer, and many go way beyond that. Whether it’s volunteering at the local food bank or being a financial coach for individuals trying to get their finances on track, giving of one’s “talent” is really important. As an employer trying to create the best environment in Corporate America for giving back, we have to evolve -- and try new things. Our workforce is younger, and what they expect from their employer is different than it was in my day. Whether it’s skill-based volunteering, or serving on boards, or donating to the charity of their choice—we want to encourage every team member to do what works best for them to build up their community. What does the next decade of support looks like for Wells Fargo? Wells Fargo will continue to help solve problems in communities by growing our philanthropic contributions as the company grows. We’ve set a long-term goal of investing 2 percent of our after-tax profits in corporate philanthropy, beginning this year, and will continue to be one of the largest corporate donors. And we’ll be more focused on going deeper, to do more on fewer social problems. We’ll also be working to leverage all of our assets to solve problems, going beyond corporate grant-making to deeper collaboration with partners and other foundations. In short, we’re moving from check-writing to solving problems. How do corporate philanthropy and business issues intersect? It’s now a given that companies need to do good and do well. It's about more than reputation, though. It’s about building the workforce we need for the future. The kind of people Wells Fargo wants to recruit and retain are the kind of people who want to work at a place that helps them make a difference – the way they want to – in their communities. It’s especially important to the younger generations (ages 21 to 38), who will soon make up the majority of the workforce. Many of our younger team members say that their job is more fulfilling when they’re provided opportunities to make a positive impact on issues they care about. They want to volunteer for – and donate to – things that matter to them to create impact. Responding to that is part of what’s driving our Corporate Responsibility evolution. Here again, the partnership with United Way comes into play. We’ll continue to partner on financial health across the country, leverage United Way’s volunteerism expertise to connect our team members to their passions and work in each of our key markets to help everyone at Wells Fargo give back in the way that works best for them. Learn more about our partnership with Wells Fargo here.